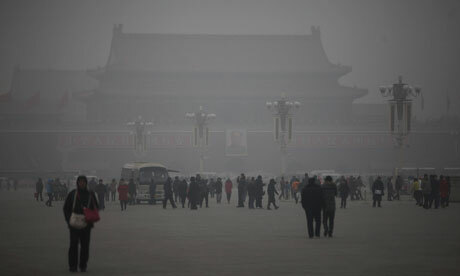 Los Angeles Photographs of Beijing are arresting these days, providing a disturbing vision of what pea soup fog almost feels like, complete with walking robots in gas mask contraptions trying to make their way about the city the best they can. Meanwhile, the headlines from Paris, where negotiators from countries all over the world are trying to parse the pollution numbers and finagle the timeline when the climate debt comes due, are little more comforting that the front page pictures from China. I find myself equally amazed and confounded by falling factoids here and there. For example, work is being done to develop something called “scuba rice,” which can survive being underwater for two weeks in more that might sustain a country like Bangladesh where 40% of the land area for 110 million people currently is subject to extensive flooding and tidal waves. If rice won’t work, then agronomists recommend they grow sunflowers. Think about it. Of course, also keep in mind that other scientists note that unless somehow Earth were able to amazingly alter it’s orbital path then in a lot less than half-a-billion years the sun will get larger and hotter and pretty much fry us anyway on land and turn the ocean into a boiling cauldron. Of course that’s such a long time, it is years past the outer range of most of our imaginations, give or take a couple of hundred million years, but tempus fugit, memento mori, it still might be worth making our best effort now. Some geo-engineers have notions for how weird science might cool down the earth somehow by triggering the formation of more clouds at the right elevations. Thin cloud “streams’ were discovered in the wake of ships. Salt particles in the right proportion could create a cloud called a “marine stratocumulus.” The technical problem for the technological Utopians is how to produce nozzles that could reliably form the right size mini-droplet that would work. Oh, and of course, there are risks when you start geoengineering, as we might imagine. Others suggest spraying Sulfur into the atmosphere because that would be even quicker and more sure fired, and would cool the earth, but only for a year or so at a time. Some naysayers warn that the cost would be stupendous. There’s also the problem, as the bankers used to say once upon a time, of “moral hazard,” by allowing governments, industries, and citizens to believe there’s a technical trick in the future that allows us to avoid all of these complicated, confusing, contentious climate problems now. This entry was posted in Ideas and Issues and tagged Beijing, Climate Change, pollution by Wade. Bookmark the permalink.